Not sure if Hallmark has released any cards for the occasion, but this is Geography Awareness Week. 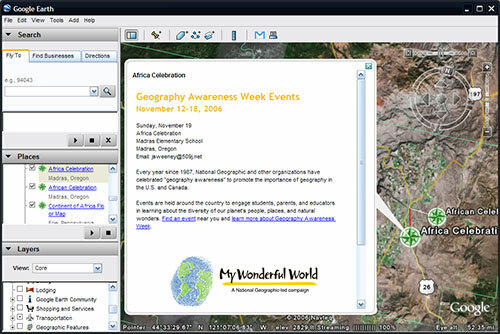 I’ve seen in some of the blogs that Google has a great Geography Awareness Week page with some great sources to people to use. Google even has a nice KMZ that enables you to find Geography Awareness events in your area (is it just me or does that placemark look a little like the OSGeo logo?). That said, there are going to be tons of GIS Day “celebrations” (use Google News to find newspaper articles announcing events in your area as the GIS Day website doesn’t have a good events search page, more of that Web 1.0 stuff) around the world and I’m sure Google Earth will be front and center. Google’s entry into the Geospatial arena is refreshing.